We’d love your help. 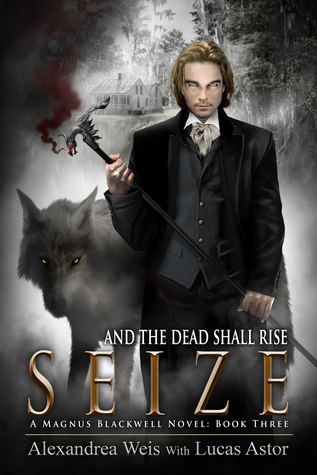 Let us know what’s wrong with this preview of Seize by Alexandrea Weis. Her dark secret remains hidden from everyone except Magnus. He sees the evil growing stronger, changing her, and hurting her marriage. If Lexie doesn’t rid herself Lexie Arden has a loving husband, a thriving business, and consults with the New Orleans Police Dept on murder cases. Kalfu has given her everything she desires, but challengers to her authority are closing in. To ask other readers questions about Seize, please sign up. REVIEW: SEIZE is the third full-length instalment in Alexandrea Weis and Lucas Astor’s contemporary, adult MAGNUS BLACKWELL paranormal, Voodoo, thriller series focusing on New Orlean’s Voodoo Mambo Lexie Arden, and her spirit guide Magnus Blackwell. SEIZE should not be read as a stand alone as it picks up immediately after the events of book two BOUND. Told from dual third person perspectives (Lexie and Magnus) SEIZE focuses on Lexie Arden’s foray into the world of black magic, powerful spirits, Voodoo priests and priestesses, and the fight for power and control. Lexie Arden is not representative of the Voodoo world but chosen by the late Mambo, Lexie must learn to navigate a world of which she knows nothing about but a world in which she continues to battle between good and evil. As the dark battles the light within our story line heroine, in the form of Damballah (The Sky Father/ Primordial Creator of Life) and Kalfu (Master of malevolent spirits/ controls the evil aspects of Voodoo), Lexie discovers that she is no longer able to trust the spirits sent to guide her on her journey. Manipulation, lies, betrayal and revenge find our heroine riding the edge of control, a control that is slowly leaning towards the evil and the dark. SEIZE and the Magnus Blackwell series continues to pull from the Haitian and African practise of Voodoo and the spiritual folkways of those who follow and believe. An infinitely detailed and complex series, Magnus Blackwell focuses on passion and power, magic and mayhem, and the spirits desperate to move on, or take control. The premise is dramatic, enticing and intriguing; the characters are colorful, energetic, powerful and bold. A blend of spiritual nepotism, and a belief system focusing on evil, retribution, and omnipotent power wherein our heroine is caught between good and evil, and Magnus is caught between this world and the Other. This is quickly becoming one of my all time favorite series: the spellbinding suspense, the intrigue, the way the characters come to life on the page and hold you in the power, the vivid depiction of the swap, the city, the rituals and so much more. To say this book holds you in it’s grasp from start to finish is an understatement. But I simply don’t have the words to describe hypnotic hold the series will have you under as you read this gripping story. Magus and Lexie are still on the path to ri This is quickly becoming one of my all time favorite series: the spellbinding suspense, the intrigue, the way the characters come to life on the page and hold you in the power, the vivid depiction of the swap, the city, the rituals and so much more. To say this book holds you in it’s grasp from start to finish is an understatement. But I simply don’t have the words to describe hypnotic hold the series will have you under as you read this gripping story. Magus and Lexie are still on the path to ridding the darkness (Kalfu) from her, consulting with the NOPD on a series of murders and holding off those who seek to remove her as Mambo. While dealing with the satanic style murders Lexie inherits a cottage in the swamps. The cottage brings her a sense of calm as well as troubles. In the cottage is a library the holds the secrets and spells of prior Voodoo spirits. A place that Kalfu can’t reach her even though the rest of the home is shrouded by Kalfu and his darkness. But will she find the secrets she needs and in time? There are a lot of twists and turns in the storyline that will keep you on your toes. As the tale unfolds we meet new characters as well as a few returning from previous books, but who can Lexie trust beside her charismatic spirit guide, Magnus? Will they find a way to rid Lexie and the city of New Orleans of the darkness? Will Lexie finally come clean with Will and if so what happens? Seize is a phenomenal addition to the Magnus Blackwell series. The story is powerful, stirring and very well written with characters that are intense and very vividly portrayed. In my humble opinion, the authors have done a masterful job with a riveting storyline and fascinating characters. My only regret is that I can’t give this book/series more than 5 stars. This is a total must read and I offer it two Huge Thumbs Up. My best advice would be to grab this series up, curl up on the couch or in your easy chair and be prepared for one mesmerizing time. Another outstanding installation in the Magnus Blackwell series. Again, this story puts you under it's spell and shows no sign of releasing you from it's clutches any time soon. Lexie and Magnus continue to find a way to get rid of the darkness inside of her but when murders of local business people begin, things start to get a little more complicated, especially since the bodies have been carved with strange markings. Lexie tries her best to help the police in solving these murders, but while i Another outstanding installation in the Magnus Blackwell series. Again, this story puts you under it's spell and shows no sign of releasing you from it's clutches any time soon. Lexie and Magnus continue to find a way to get rid of the darkness inside of her but when murders of local business people begin, things start to get a little more complicated, especially since the bodies have been carved with strange markings. Lexie tries her best to help the police in solving these murders, but while investigating things, she begins to bring herself deeper into the darkness that surrounds the area. Soon she finds that she can trust no one; no one except for Will and Magnus. But because she trusted someone she shouldn't have, Magnus is gone. Now Lexie will have to fight to get him back. This story has quite a few surprises, twists and a few moments that will make you gasp. New supporting characters enter into this story, some are friends and others are not. But you will definitely recognize the ones from the previous book. And these characters; they are so very well written and so very complex. The storyline is brilliant! It captures you attention from the very first paragraph and holds your attention making it hard to put down until you finish. The description of the city, the swamp, the homes; both old and new are so remarkably detailed that you are able to envision them quite well in your mind's eye. Amazing book!!! It has everything. Excitement, adventure, mystery, horror and so much more. I cannot wait to read the next one. The entire series is amazing. A must read!!!! Alexandrea Weis is an advanced practice registered nurse who was born and raised in New Orleans. Having been brought up in the motion picture industry, she learned to tell stories from a different perspective and began writing at the age of eight. Infusing the rich tapestry of her hometown into her award-winning novels, she believes that creating vivid characters makes a story moving and memorable Alexandrea Weis is an advanced practice registered nurse who was born and raised in New Orleans. Having been brought up in the motion picture industry, she learned to tell stories from a different perspective and began writing at the age of eight. Infusing the rich tapestry of her hometown into her award-winning novels, she believes that creating vivid characters makes a story moving and memorable. A permitted/certified wildlife rehabber with the Louisiana Wildlife and Fisheries, Weis rescues orphaned and injured wildlife. She lives with her husband and pets in New Orleans.